1. TOP 2 manufacturer of Hydraulic Breaker. Factory running more than 14 years in China. 2. Over 163 agencies in Chinese Domestic Market, perfect sales network help BLTB breaker well knew by customers. 3. Keeping developing new type breaker as customers’ requirement, like autolub greasing type breaker. 4. 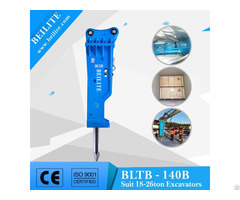 With ISO 9001/ CE certification and friendly environment breaker, our BLTB breaker warmly welcomed overseas market. Welcome your enquire at any time. Hope can have win to win business. Business Description: Our company is one of the largest professional manufacturers of hydraulic breakers. We offer a wide variety of breaker series and spare parts to our customers. With the aim of "quality comes first, the credibility of the first purpose", high quality and professional services not only win us powerful domestic agents all over China, but also attract customers from America, England, India and other international markets. We will take the advantage of being a manufacturer to provide full support for our customers, including competitive price, after-sales service, fast delivery time and advertising and so on. BLTB series is a newly designed product with high reliability and safety. Our company spends a lot of money on buying vertical, horizontal machining center and a series of advanced production equipment. Our company becomes a new enterprise with strong technical force and complete detection means, well-equipped with advanced production technology. Welcome people at home and abroad to guide and cooperate with us and get the bright future together!